We now know it to be true that our plant has warmed, primarily as a result of our burning fossil fuel and paving over the landscape, thereby adding to the existing volume and concentration of greenhouse gases in Earth’s atmosphere. Those gases, such as carbon dioxide, methane, and nitrous oxide, capture a significant amount or heat that radiates from Earth’s surface after the Sun’s rays strikes the surface. But those same gases are emitted from jets, cars, trucks, trains, ships, construction vehicles, military land, water and air travel vehicles, electric power generating plants, and by many other fossil fuel burning sources from human generated greenhouse gas sources. Our paving over of billions of acres of CO2 consuming Earth’s plant life with Portland cement, asphalt and overlaying structures on our the earth’s have replaced the green life that once absorbed carbon dioxide from Eaerth’s atmosphere, resulting in more oof that gas. Being left in the atmosphere for warming the planet. As a result, the surface air and waters have warmed close to 2 degrees above what they otherwise would have been had humans not been around. 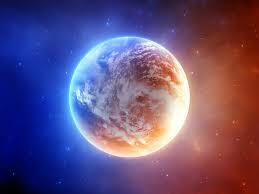 So we humans have permanently altered and warmed the surface of the planet. This iOS now plainly visible by not just the rise in sea water and shrinking ice cover at the poles and mountain tops around the surface of the earth, but also the increase in severity of damaging, injury and death causing weather related physical disasters BY FIRE, FLOODS, HEAT AND DRYNESS AND SEVERE STORMS AROUND THE WORLD, A which has already caused a STATE OF CRISIS FOR MANY POPULATION. Sadly, these types of disasters to our human animal populations are growing worse and worse. For each and every day people on earth continue about their usual business using fossil fuels to obtain energy (by burning them – natural gas, oil and coal), paving over the carbon dioxide consuming green space on the planet, the possibilities for heading off an impending worldwide calamity by the end of this century grow slimmer and slimmer. We now know it’s true the ability of our Earth’s oceans and atmosphere to safely absorb our continuing additions of the above greenhouse gases HAS MAXED OUT. To See more detail, please read or listen to: “Ocean Shock: The Climate Crisis Beneath the Waves” – With Maurice Tamman, journalist contributor to Reuters news agency, interviewed on WORT-FM’s A Public Affair, November 26, 2018. WORT-FM radio in Madison, Wisconsin, U.S., broadcasted a show interviewing the author of this artical last week. The show was on the program called “A Public Affair” at noon on November 26, 2018. WORTFM RADIO freely available for anyone to hear – 24 hours a day – on the internet at WORTFM.ORG.